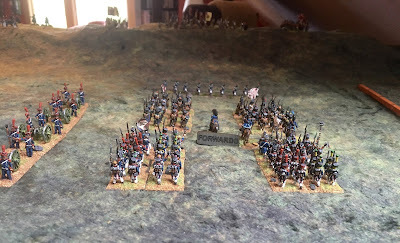 I thought I would see how GdA works with less then the recommended number of brigades, so I took the Vimeiro Hill scenario from the General de Brigade Scenario book #5. Here we have 3 brigades per side and the British only have 2 until turn 5. Below we can see the hill in the farground with the 3 attacking French brigades in the foreground. Very little terrain is required so it is a simple terrain to set up. 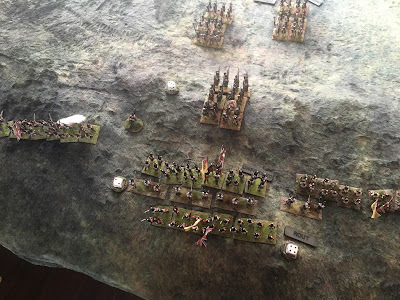 The scenario sets the game at 12 turns with the British having to break 3 French Brigades or alternately the French have to have units on Vimeiro Hill and break 2 British Brigades. The hill is a gentle slope so offered no impediment to movement. 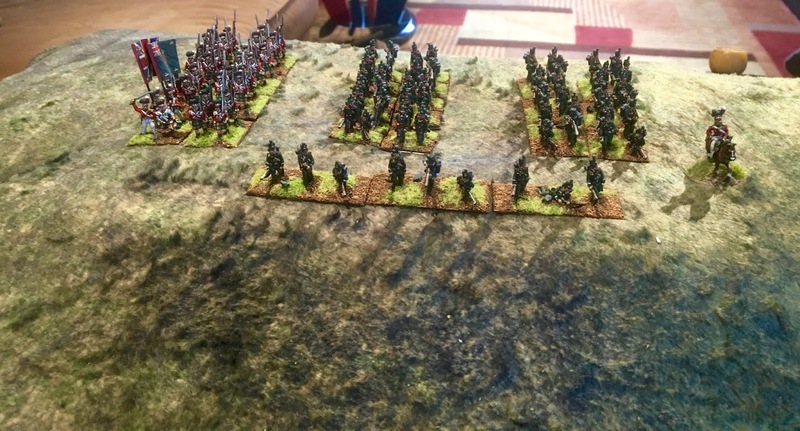 On the British right flank is Fane's brigade made up of the 50th Foot (large) and a two regular battalions, the 5/60th and the 2/95th with some skirmishers from the 1/95th rifles. These units are of Line quality except the 95th that are graded as Veterans. Attached to Fane's brigade is a RFA battery, in the background we can see Wellington with his 3 ADC's. 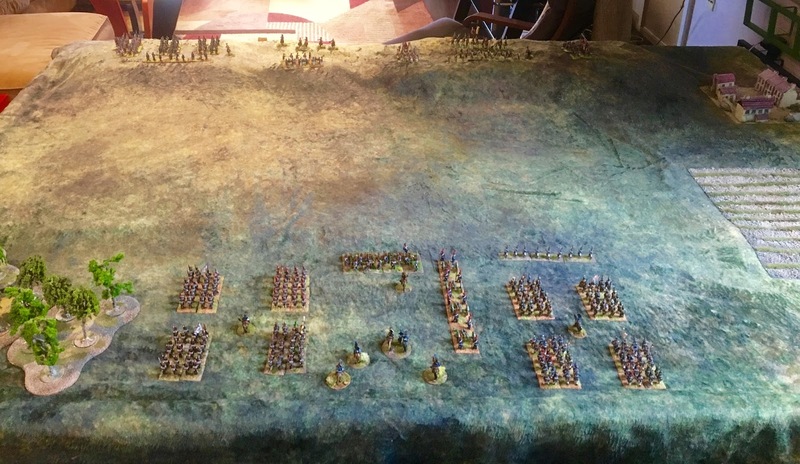 As one British brigade is not available until turn 5, one ADC can only be activated only on a 5 or 6. Anstruther's Light Brigade on the British left flank, made up of 4 regular sized battalions; the 9th, 43rd, 52nd and 97th battalions with some skirmishers detached from their light companies. The two light battalions are Veteran and the other two are Line. 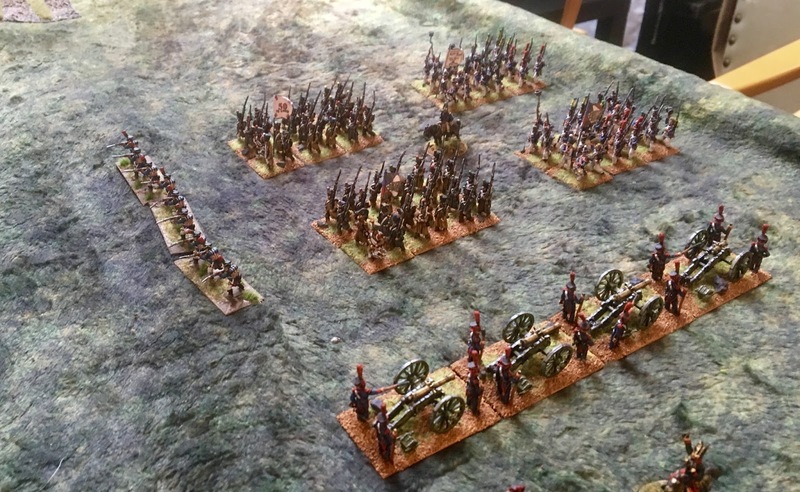 Here we have Charlot's brigade made up of 4 battalions of line as well as some detached skirmishers and an attached medium foot battery. These were all graded as line. Here are two small brigades, to the right of the photo is Kellerman's brigade comprised of just 2 battalions of Elite combined Grenadiers. Next to it is another small brigade of 2 battalions of Veteran Grenadiers under GdB St Clair. They have an attached Veteran Foot Battery of 4pders. Charlotte's brigade assemble into Attack columns and advance to take the hill! They are encouraged forward by Junot's ADC's with a Forwards Tasking. On the next turn Junot uses his ADC's to give direct orders to take the hill by the Infantry Assault Tasking. 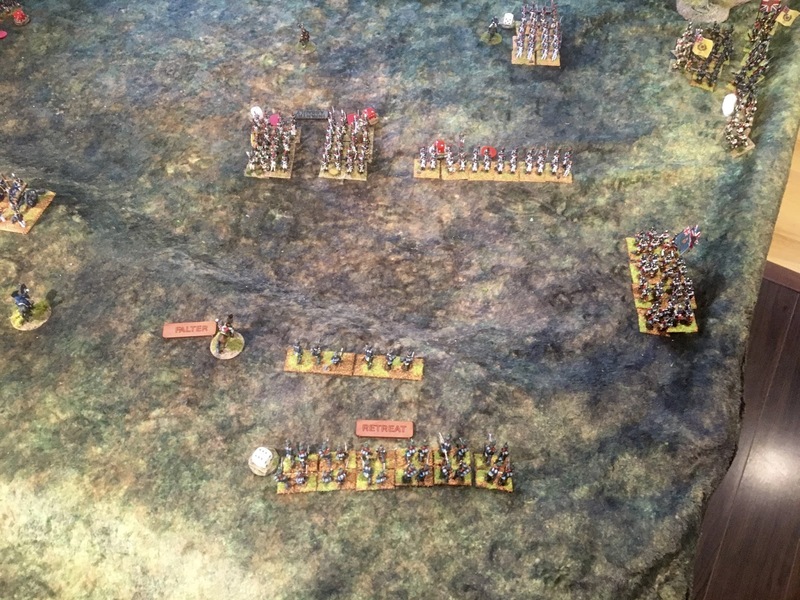 This allows multiple battalions to charge with support/ care was taken to avoid the mass battalions disadvantage. I use red discs to indicate a charging unit, the mini dice are recording causalities. As Charlot's lead two battalions charge the British line fires in response causing some attrition. 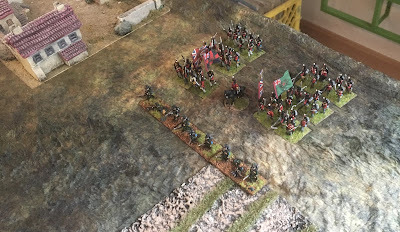 One French battalion is thrown back but the 1/32e ligne charges home, engages in melee and drives back the 9th regiment of foot. 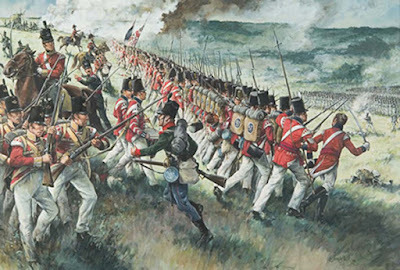 ................but unfortunately for the British, the French are able to charge home and Rout the Rifles causing the brigade to Falter. 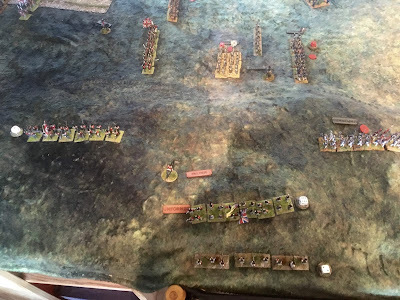 The British right flank is collapsing. 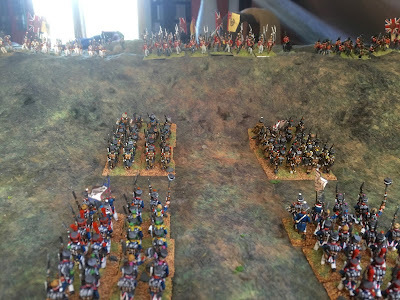 Back to the French left flank, Turn 5 finally and Acland's Brigade arrives. 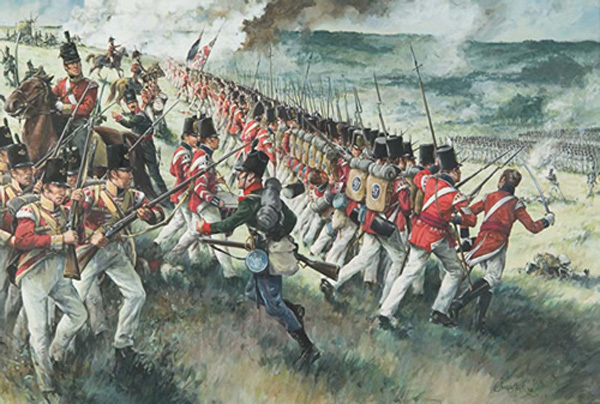 The Line 2nd and 20th Foot advance with Elite rifle-armed skirmishes. 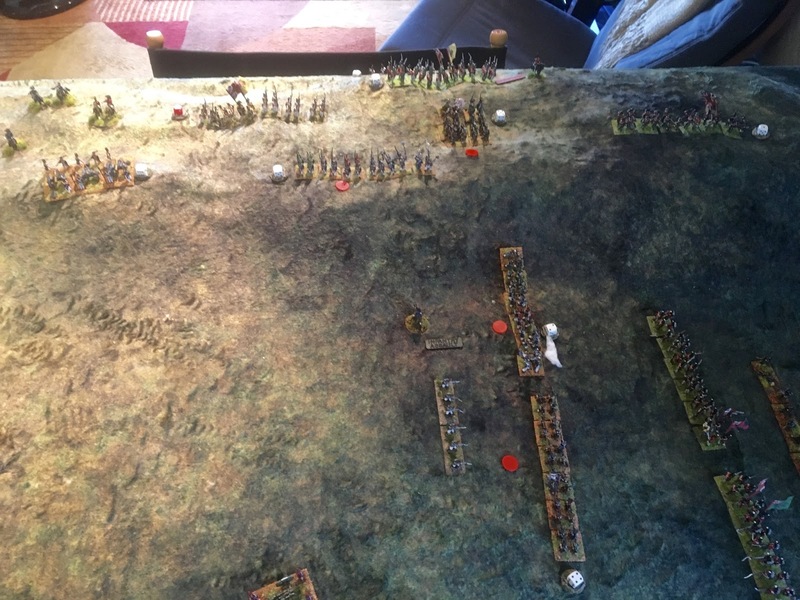 Charlot sends his 2 rear battalions to protect his right flank, they get placed on Infantry Assault and by good dicing are able to throw back Acland. The 20th Foot Rout! 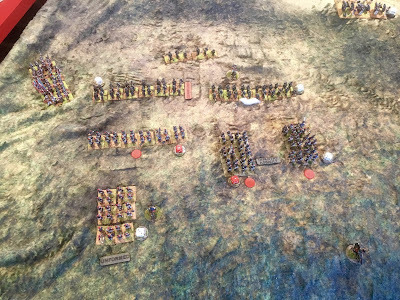 Fane's brigade is pushed off Vimeiro Hill, 2 battalions are dispersed. 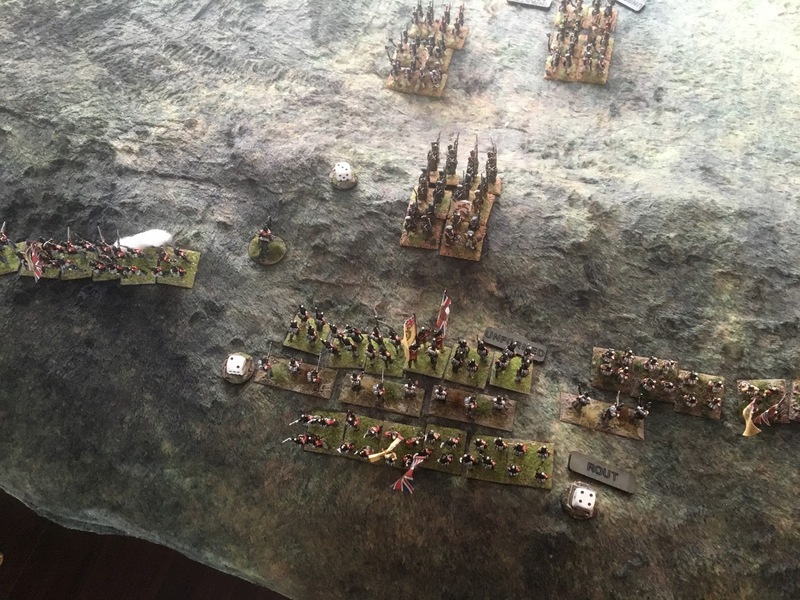 All 3 British brigades are faltering so on turn 9 the British withdraw and relinquish the Hill! So a great game, I hope to play this again at the Hobby Bunker tomorrow with Adam. I plan to add an ADC to each side. Playing solo is OK but a real opponent is better. As you can probably tell I am really enjoying this set of rules. Great looking game and write up! Thank you for posting. Thanks Mad Mac, I have quite enjoyed your Picket's Charge AR, I have the troops so hope to give it a try. Great, thanks for the write up! Excellent. 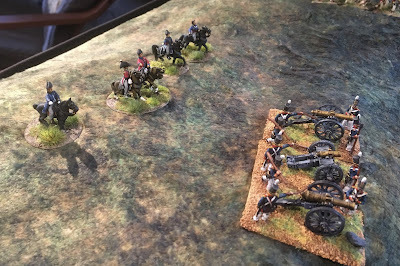 Had a game tonight with only 3 brigades per side. Worst dice throwing ever! Very pleased i forgot to take my phone. Well done John. 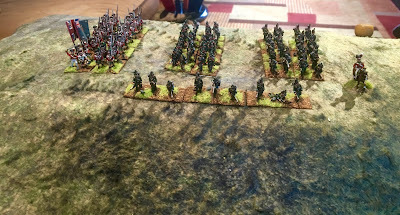 General de Brigade never clicked for me, so it interesting to see another (and much keener) perspective on that line of rules. Cheers! Yes I had no interest in GdB,it was too granular and I did not like the basing scheme. This game is quite enjoyable and plays well with a excellent Napoleonic feel. Nice looking, atmospheric, game. It is much better playing against someone but at times you don't have a choice if you want a game. 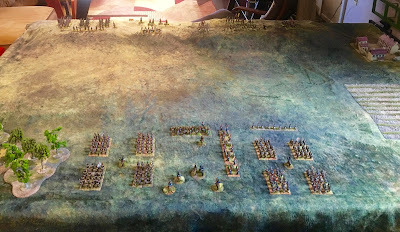 I played this scenario again last evening with an opponent, he picked up the game very quickly and we had great time. You are really lucky that you have a club, I had just 2 semi-regular opponents who I can play. It seems to me that it is too easy to defeat lines using attack columns. In fact, I think that attack columns are heavily favoured in these rules. 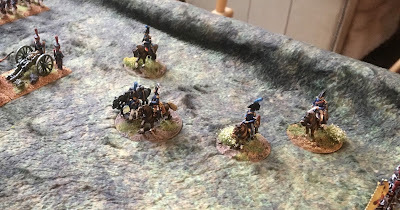 In the end, maybe, everyone will only use attack columns, and for every situation, and squares only against cavalry charges. It seems to me that lines are too vulnerable and useless in these rules. At least this is my impression, but I may be wrong. I think you do not have a clue what you are talking about! AC are disfavored when they fire (half the result), they have no advantage when they charge, they have a slight advantage when they melee, but the chance of melee is very slim as it should be in this ruleset. So yes, in my opinion you are wrong. But why do you not play the game. It is always interesting to me that the Napoleonic cognoscenti always seem to make the same statement about every ruleset. The AC is too strong! Keep calm, please. Your reply is not very polite. It is a ruleset, not the Bible. I have only expressed my first impressions, with humility. I am not a ‘Napoleonic cognoscenti’, whatever such stupidity means. And you don’t know what statements I have made about every ruleset. I have the rulebook and I am reading it carefully before playing the first games. So, I have expressed my opinion remarking that I might be wrong. In your report, most assaults carried out by columns were successful (75%). And after reading the rules and modifiers regarding charges, charges results and melees, my first conclusion is that lines are too vulnerable and unreliable in too many circumstances, so it is preferable to use attack columns in all situations, even although their fire is not impressive. In these rules, it is not a good idea to stand in line against a frontal cavalry charge (but historically the weak points were the flanks). So, again, it is a better idea to use attack columns (+2 modifier, and no negative modifier to form square). Yes, lines fire better than columns, but it is not worth, especially taking into account their general unreliability in most circumstances. But, again, it is only my humble opinion. Maybe I will have another one after playing several games. Oh dear, now have done it. I've been following your experiences with these rules with great interest John. As you know, I'm a rules junkie, so I'm definitely going to get a copy and give them a whirl with the lads here. Thanks for the AAR! i will look forward to hearing your opinion.